Hot Wheels Falcon Playset With Movie Ticket Just $13.99! Down From $40! You are here: Home / Great Deals / Amazon Deals / Hot Wheels Falcon Playset With Movie Ticket Just $13.99! Down From $40! Amazon has this Hot Wheels Falcon Playset With Movie Ticket on sale for just $13.99 down from $39.99 PLUS FREE shipping with Amazon Prime or for orders $25 and above! 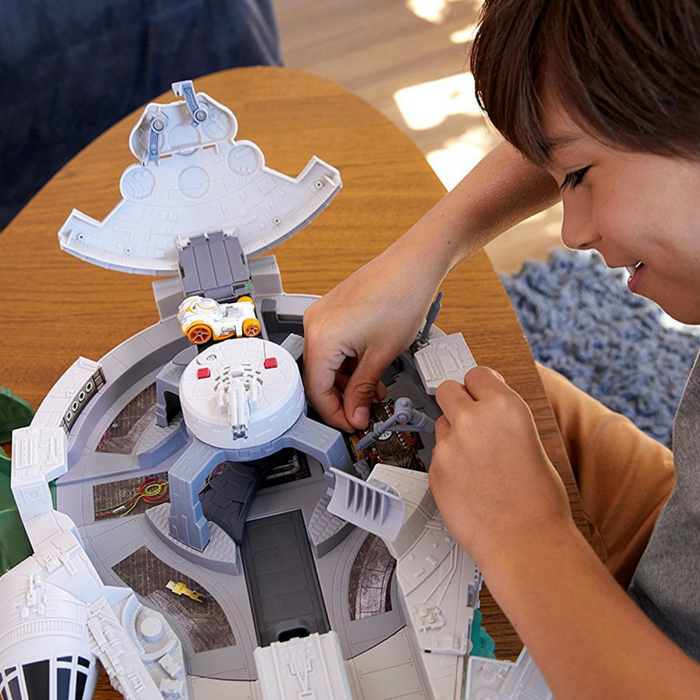 The Hot Wheels Star Wars Millennium Falcon playset allows kids to reenact their favorite scenes from the Star Wars universe using their collection of Hot Wheels Character Cars. The Millennium Falcon has broken down and must be fixed for battle before the First Order launches their attack! Take the elevator up to fix the hyperdrive, tune up the engine and man the guns. When ready to launch an attack, lower your vehicle into the Smuggler’s Bay, aim carefully and then launch your Character Car along the Hot Wheels track and towards the First Order to take them out and defeat the dark side! Other features include lights and 20+ Star Wars sounds. Prepare the Millennium Falcon Track Set for battle by fixing the hyperdrive and checking the engines! Lower your character cars into the Smugglers bay then launch them out of the Falcon, along the Hot Wheels track towards the First Order to take them out!